The Horizon Energy Box provides a complete understanding of how fuel cell technology interacts with renewable energy sources to create an entirely sustainable power grid. Students learn about solar power, wind energy, kinetic energy from a hand crank and a demonstration of the incredible storage potential of a super capacitor. There’s a range of fuel cells to compare: PEM hydrogen fuel cell, the salt water fuel cell and a direct ethanol fuel cell - countless experiments, so many scientific principles at work and plenty of space for creativity. Fuel cell science from fuel cell experts: PEM, direct ethanol, salt water and reversible fuel cells in one kit. 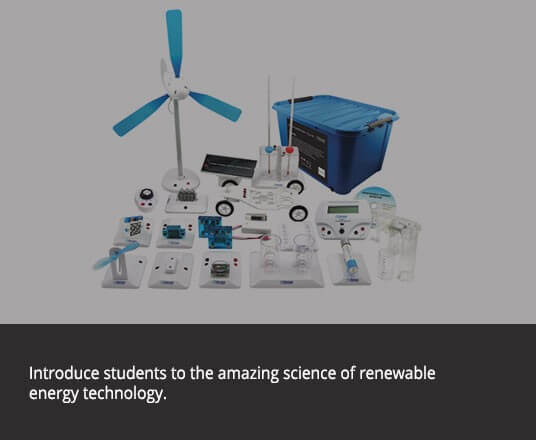 Introduction to renewable energy: solar panel, wind turbine, temperature cell and hand crank. Includes super capacitor to demonstrate the latest in energy storage technology.